SMALL: Sheet: 10.8"x18" Design: 8.4"x15"
MEDIUM : Sheet: 14.5"x24", Design: 11.75"x21"
Our craft size stencil Houndstooth is perfect for smaller DIY home decor projects where a wall stencil would be too large. 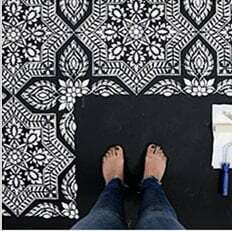 These trendy stencils are great for stenciling your own designer pillows, curtains, or transforming garage sale furniture finds into cool decorative pieces. However, it doesn't end there: stencil lamp shades, kitchen backsplashes, doors, table tops, picture, and mirror frames, or create your own work of art on pre-stretched canvas. Decorative possibilities are endless with these versatile reusable stencils!